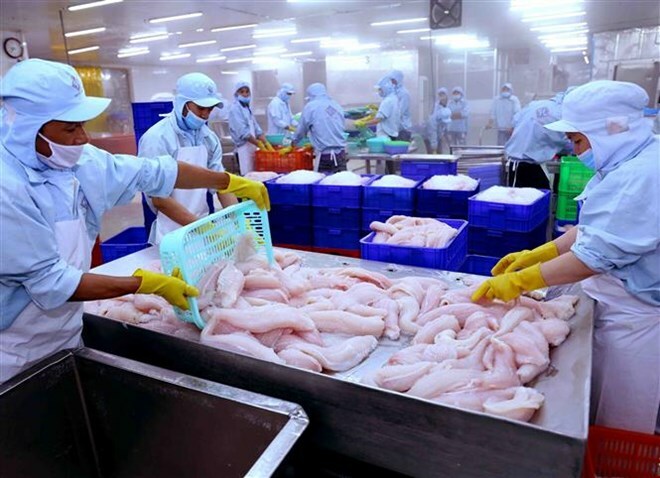 Quang Ninh (VNA) – Deputy Prime Minister Trinh Dinh Dung has urged the fisheries sector to build a safe and high-quality seafood brand, continue increasing the quality of products, maintain traditional markets and develop new ones. Addressing a ceremony to mark the 60th traditional day of the sector in the northern coastal province of Quang Ninh on March 31, Dung affirmed that its development goals are to step up industrialisation and modernisation, achieve comprehensive and sustainable development, become a major commodity sector with appropriate production organisation forms and structure, gradually raise income and living conditions of farmers and fishermen, protect the ecosystem and contribute to defence and security. He asked the sector to speed up disseminations for fishermen to obey Vietnamese law as well as international regulations on fishing and aquaculture that Vietnam joins. Minister of Agriculture and Rural Development Nguyen Xuan Cuong said that the volume of Vietnam’s aquatic products exceeded 7.4 million tonnes in 2018, a 5.6-fold increase compared with that of 1995. They have been sold to over 170 markets, with the total export turnover surpassing 9 billion USD last year, making Vietnam one of the world’s largest aquatic product exporters. According to him, Resolution No.36 of the 12th Party Central Committee on the sustainable development strategy of the Vietnamese maritime economy until 2030 with a vision to 2045 sets a target of turning Vietnam into a strong sea-based nation which meets basic criteria on sustainable maritime economic development and take the initiative to respond to climate change, sea-level rise, coastal erosion and saltwater intrusion.